As I mentioned previously, millions of people around the world are observing Ramadan. This means they don’t eat or drink during sunlit hours. This enables people to understand what it’s like to go without food or water, and feel more connected to individuals in need. By going through this arduous lifestyle for a month you get rewarded, or at least, that’s the motivating factor. And while it is delightful to see people sacrificing so much in their lives to become more conscious and aware of the hardships faced by others, it is sad to see that it is also a month of increased food waste. The reason behind this varies, but two main factors are: 1) shrinking stomach capacity and 2) a need for abundance. Fasting for a long time means that our stomach capacity decreases and we can’t intake high volumes of food. But, fasting has a different effect on the eyes. When we see food we become more hungry and sitting behind a table overflowing with food becomes a must. Not only because we want to see more food, but because during Ramadan everyone must share food with those in need. So, having an abundance of it is considered vital. However, this means that organizers who try to satisfy the needs of the people end up being culprits behind wasted food. Yet, some individuals have taken notice and want to change this phenomenon. Being an advocate of reducing global food waste I also wanted to contribute to this cause. In this post you see two slogans that can be downloaded and shared with all individuals who organize iftar dinners. For instance, a good friend of mine organizes such dinners in London. When I approached him with this thought he accepted that his organization does witness food waste and that they’d be open to tackle this problem. Probably the biggest producers of food waste end up being religious organizations, such as Mosques. But whether it is a big or a small organization, these slogans can be used by all. By displaying the holy scripture in both English and Arabic, my organization ensured that the phrases can be read by all followers. And thanks to my amazing friends who helped me translate these slogans into Arabic, I was able to create materials that remind people the importance of curbing, not increasing, food waste during Ramadan. To all those who are fasting – thank you for your strength and commitment! 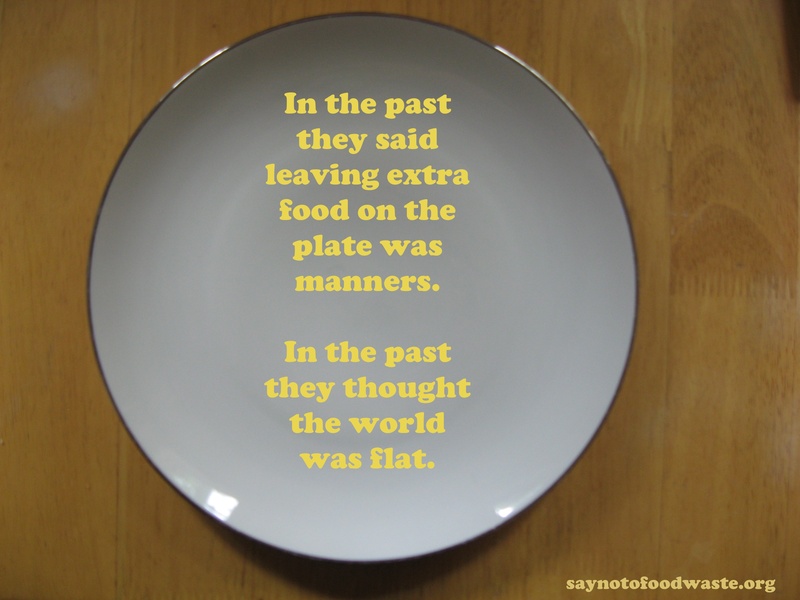 Let’s make sure that we do not harm our planet and hurt others by wasting valuable food. Knowing that millions go hungry throughout the year, not because of religion but because they simply can’t afford to buy produce, means we ought to pay increased attention to our actions, especially during this holy month. P.S. If you have further questions, feel free to contact me directly. I haven’t been lucky to take part in an Indian Wedding, at least not yet, but that is on my top 10 things to do before I die. All the colors, the beautiful music, silk saris, and delicious food! It’s a piece of heaven on Earth, especially if you are a big lover of food and music like me. So when our blog reader messaged me and told me about his wedding in Mumbai and that he’d like to include some slogans to bring the guests attention to food waste that happens at big gatherings, I jumped for joy! It was incredible to see how concern for stopping food waste spans continents, language barriers, traditions and everything else that we see as factors separating us. One of the biggest ideas behind Say No To Food Waste was to bring us all a bit closer, and make the discussion about food waste more prominent in our global village. Today I’m happy to see that this dream is slowly coming true. Can’t wait for all the future weddings and festivities Say No To Food Waste will take part in! If you are reading this and planning a wedding or some big festivity and would also like to get your guests to stay conscious about food waste, drop me a line. I’d be happy to help you with that! For all the wedding slogans and a few images from the wedding, visit the Facebook album.